Short Sell Ideas: Will Overstock.com End Up At Zero? Overstock’s attempt to capitalize on “blockchain mania” appears to have fallen flat. The SEC is investigating it ICO fund-raising scheme and a class-action lawsuit has been filed in connection with the deal. OSTK finally announced today that it was pulling its attempt to unload 4 million shares on the public. This is after a failed effort to sell its e-commerce business. Meanwhile, OSTK’s operating losses are mounting, including a big loss in Q4, a period in which retailers can put on a blind-fold and make money. I believe OSTK can be profitably shorted at its current price of $33 if you are willing to endure periods in which the stock might respond to highly promotional announcements from the Company that would cause the stock to spike up temporarily. My ultimate price target is below $10. As I write this (Thursday, March 29th), CNBC is reporting that Overstock has canceled its 4 million share offering, though the Company has not issued a formal press release to that effect. 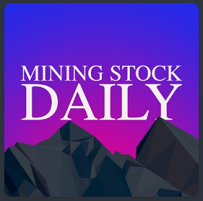 The reason given is “market conditions.” If this is true, in my view, it means that a lack of demand at the current stock price – $37 – would have necessitated pricing the deal significantly lower in order to place the shares. I would suggest that this indicates that OSTK stock is headed lower anyway. 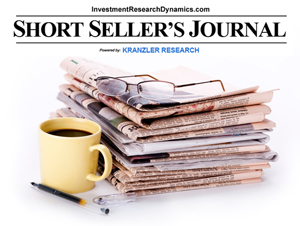 You can learn about short ideas in the Short Seller’s Journal, a weekly newsletter that provides insight on the latest economic data and provides short-sell ideas, including strategies for using options. You can learn more about this newsletter here: Short Seller’s Journal information. 2008 Redux-Cubed (at least cubed)? Many of you have likely seen discussions in the media about the LIBOR-OIS spread. This spread is a measure of banking system health. It was one of Alan Greenspan’s favorite benchmark indicators of systemic liquidity. LIBOR is the London Inter-Bank Offer Rate, which is the benchmark interest rate at which banks lend to other banks. The most common intervals are 1-month and 3-month. LIBOR is the most widely used reference rate globally and is commonly used as the benchmark from which bank loans, bonds and interest rate derivatives are priced. “OIS” is an the “overnight indexed swap” rate. This is an overnight inter-bank lending benchmark index – most simply, it’s the global overnight inter-bank lending rate. The current 1-month LIBOR-OIS spread has spiked up from 10 basis points at the beginning of 2018 to nearly 60 basis points (0.60%). Many Wall Street Einsteins are rationalizing that the LIBOR-OIS spread blow-out is a result of U.S. companies repatriating off-shore cash back to the U.S. But it doesn’t matter. That particular pool of cash was there only to avoid repatriation taxes. The cash being removed from the European banking system by U.S corporations will not be replaced. The large pool of dollar liquidity being removed was simply masking underlying problems – problems rising to the surface now that the dollar liquidity is drying up. Keep in mind that the effect of potential financial crisis trigger events as reflected by the LIBOR-OIS spread since 2009 has been hugely muted by trillions in QE, which have kept the banking system liquefied artificially. Think of this massive liquidity as having the effect of acting like a “pain killer” on systemic problems percolating like a cancer beneath the surface. The global banking system is addicted to these financial “opioids” and now these opioids are no longer working. Before the 2008 crisis, the spread began to rise in August 2007, when it jumped from 10 basis points to 100 basis points by the end of September. From there it bounced around between 50-100 basis points until early September 2008, when it shot straight up to 350 basis points. Note that whatever caused the spread to widen in August 2007 was signaling a systemic financial problem well in advance of the actual trigger events. That also corresponds with the time period in which the stock market peaked in 2007. What hidden financial bombs are lurking behind the curtain? There’s no way to know the answer to this until the event actually occurs. But the market action in the banks – and in Deutsche Bank specifically – could be an indicator that some ugly event is percolating in the banking system, not that this should surprise anyone. The likely culprit causing the LIBOR-OIS spread is leveraged lending. Bank loans to companies that are rated by Moody’s/S&P 500 to be mid-investment grade to junk use banks loans that are tied to LIBOR. The rise in LIBOR since May 2017 has imposed increasing financial stress on the ability of leveraged companies to make debt payments. But also keep in mind that there are derivatives – interest rate swaps and credit default swaps – that based on these leveraged loans. These “weapons of mass financial destruction” (Warren Buffet) are issued in notional amounts that are several multiples of the outstanding amount of underlying debt. It’s a giant casino game in which banks and hedge funds place bets on whether or not leveraged companies eventually default. DB’s stock price has plunged 33.8% since the beginning of January 2018. It’s dropped 11.3% in just the last three trading days (thru March 23rd). There’s a big problem behind the “curtain” at Deutsche Bank. I have the advantage of informational tidbits gleaned by a close friend of mine from our Bankers Trust days who keeps in touch with insiders at DB. DB is a mess. DB, ever since closing its acquisition of Bankers Trust in the spring of 2000, has become the leading and, by far, the most aggressive player in the global derivatives market. During the run-up in the alternative energy mania, DB was aggressively underwriting exotic derivatives based on the massive debt being issued by energy companies. It also has been one of the most aggressive players in underwriting credit default swaps on the catastrophically leveraged EU countries like Italy and Spain. DB is desperate to raise liquidity. Perhaps its only reliable income-generating asset is its asset management division. In order to raise needed funds, DB was forced to sell 22.3% of it to the public in a stock deal that raised US$8 billion. It was originally trying to price the deal to raise US$10 billion. But the market smells blood and DB is becoming radioactive. The deal was floated Thursday (March 22nd) and DB stock still dropped 7% on Thursday and Friday. Several U.S. banks are not far behind in the spectrum of financial stress. Citigroup’s stock has declined 15.1% since January 29th, including a 7.5% loss Thursday/Friday. Morgan Stanley has lost 11.8% since March 12th, including an 8.8% dive Thursday/Friday. Goldman Sachs’ stock has dumped 11% since March 12th, including a 6.3% drop on Thursday/Friday. JP Morgan dumped 6.7% the last two trading days this past week (thru March 23rd). If Deutsche Bank collapses, it will set off a catastrophic chain reaction of counter-party defaults. This would be similar to what occurred in 2008 when AIG defaulted on counter-party derivative liabilities in which Goldman Sachs was the counter-party. While it’s impossible to prove without access to the inside books at DB and at the ECB, I believe the primary driver behind the LIBOR-OIS rate spread reflects a growing reluctance by banks to lend to other banks for a duration longer than overnight. This reluctance is derived from growing fear of DB’s deteriorating financial condition, as reflected by its stock price. The commentary above is from last week’s issue of the Short Seller’s Journal. In addition to well-researched insight into the financial system, the SSJ presents short-sell ideas each week, including ideas for using options. This week’s issue, just published, discusses why Tesla is going to zero and how to take advantage of that melt-down. You can find out more about this service here: Short Seller’s Journal information. The stock now trades at a 31x PE ratio, for whatever that’s worse. I’m sure if I went through the numbers closely, I could find numerous accounting manipulations which added a copious amount of non-cash income to BA’s numbers. BA’s revenues on a trailing 12 month basis are flat. From 2015 to 2016, its revenues declined 1.7%. On a trailing twelve month basis vs. 2016, its revenues have dropped 3.2%. Historically paying a nose-bleed PE ratio for a company with deteriorating revenues and an enormous amount of debt does not produce a good result. Chasing the price-momentum higher and waiting for a bigger idiot to buy shares from you works well until the music stops. Then everyone gets hurt. The Dow moved up an average of 120 pts per day in the nine trading days since the end of 2017. This includes one day in which the Dow dared to close 12 pts lower. That one day felt like a bear market. Over this entire period the Dow has appreciated 4.4%. Since the election, including the 1,000 pt plunge in the Dow futures that occurred when it was apparent Trump would win, the Dow has soared nearly 50%. What’s driving this? Since late August, the public has literally thrown money blindly into passively managed ETFs which automatically distribute the cash inflow by market cap weighting into the stocks in the index that underlies the ETF. This means that most of the gains are concentrated in the stocks in the Dow/SPX with the largest market caps, which then drives the Dow/SPX higher. For instance, last Friday, the Dow was up 0.89% but AMZN was up 2.2%, Netflix was up 1.8%, GOOG was up 1.5% etc. There’s no telling how much longer this can persist without some type of accident. Judging by the data on cash in customer brokerage accounts at the big online brokers , I would have to believe that this last push from the retail investor is nearing its completion. Data from the fund industry has shown a massive migration of investor cash moving out of actively managed mutual funds and into passive index funds. This would include money managed on behalf of individuals by registered investment advisors. 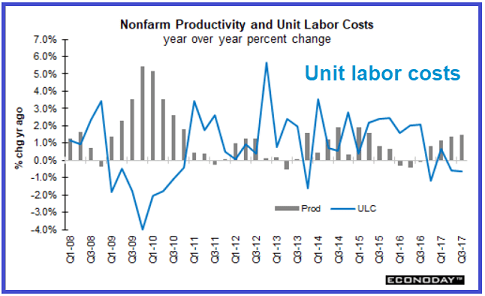 For now, the raging bulls chasing momentum conveniently ignore the deterioration in “new orders” and “employment” numbers in deference to the statistically manipulated headline reports that purport to show economic growth. Most of the bullish reports are overweighted with “sentiment” and “hope” metrics that offset declining real economy statistics. Credit card and auto loan delinquencies – both subprime and “prime” – continue to increase a double-digit rates (see WFM or COF’s latest quarterlies, for instance). As for the “prime” credit rating designation of 2017, it’s not your mother’s “prime” credit rating. At this point I don’t want to speculate on how much longer that Dow/SPX/Naz can go straight up. Historically this is the type of market behavior which has marked the blow-off top of speculative manias and has preceded serious market accidents. Is this the “Mother Of All Blow-Offs?” Probably. The players all start out with reasonable amounts of money to speculate on real estate. As the game proceeds, players collect $200 by simply passing Go and use this money to speculate on real estate. By the end of the game, only $500 dollar bills are worth anything, the whole thing blows up, and most players end up destitute. In a twist of irony, an original game board sells for about $50,000. A fixed amount of real estate and continuously increasing money supply, with “passing Go” functioning as the game’s monetary printing press. The monopoly analogy is readily applied to the current real estate market. The Fed tossed roughly $2 trillion into the mortgage market, which in turn has fueled the greatest U.S. housing bubble in history. The most absurd example I saw last week is a 264 sq ft studio in Los Angeles listed on 10/26 for $550,000. The seller bought it a year ago for $335,000. This is the degree to which Fed money printing and easy access Government guaranteed mortgages have distorted the system. The graphic above shows rampant credit-induced monetary inflation. On the left, home prices nationally are measured by the Case Shiller index going back the 1980’s. On the right is the S&P 500 going back to 1930. According to the Fed, real median household income has increased 5% between 2008 and the present. In contrast, based on Case Shiller, home prices nationally have soared 34% in the same time period. Expressed as a ratio of average price to average household income, home prices are, at all-time highs in the U.S. This is the manifestation of rampant inflation in credit availability enabled by the mortgage “QE.” This growth rate in money and credit supply has far exceeded the tiny growth rate in average household income since 2008. The stock market reflects the monetary inflation of the G3 Central Banks, primarily, plus global Central Bank balance sheet expansion. 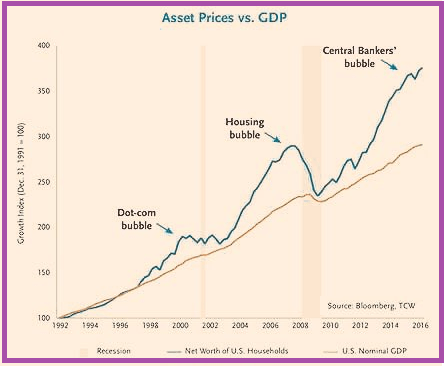 Please note that “balance sheet expansion” is the politically polite term for “money printing.” The meteoric rise in stock prices have never been more disconnected from the negligible rate of growth in nominal GDP since 2008. Real GDP has been, arguably, negative if a realistic inflation rate were used in the Government’s GDP deflator. Inflation is not showing up in the Government CPI report because the Government does not measure inflation. The Government’s basket of goods is constantly juggled in order to de-emphasize the rising cost of goods and services considered to be necessities. In addition to the increasing cost of necessities like gasoline, health insurance and food, inflation is showing up in monetary assets. This is because a large portion of the money printed remains “inside” the banking system as “excess reserves” held at the Fed by banks. This capital is transmitted as de fact money supply via the creation credit mechanisms in the various forms of debt and derivatives. The eventual asset sale avalanche grows larger by the day. Do not believe for one split-second that the U.S. has reached some sort of plateau of economic nirvana that will self-perpetuate. To begin with, it would require another round of even more money printing just to sustain the current bubble level. Read the inflation example above if that idea is still not clear. In 1927, John Maynard Keynes stated, “we will not have any more crashes in our time.” In the October 16, 1929 issue of The New York Times, famous economist and investor, Irving Fisher, stated that “stock prices have reached what looks like a permanently high plateau. 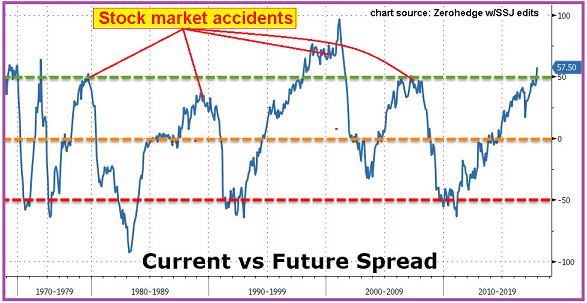 I do not feel there will be soon if ever a 50 or 60 point break from present levels, such as (bears) have predicted. I expect to see the stock market a good deal higher within a few months.” Two weeks later the stock market crashed. The above commentary is from last week’s Short Seller’s Journal. Speaking of the housing market, admittedly my homebuilder short positions are crawling up my pant-leg with fangs as the housing stocks have entered into the last stage of a parabolic “Roman candle” apex and burn-out. The homebuilders appear to be cheap relative to the SPX on a PE ratio basis – approximately an 18x average PE for homebuilders vs a 32x Case Shiller PE for the SPX. However, in relation to their underlying sales rate, earnings and balance sheet, the homebuilder stocks are more overvalued now than at the last peak in 2005. 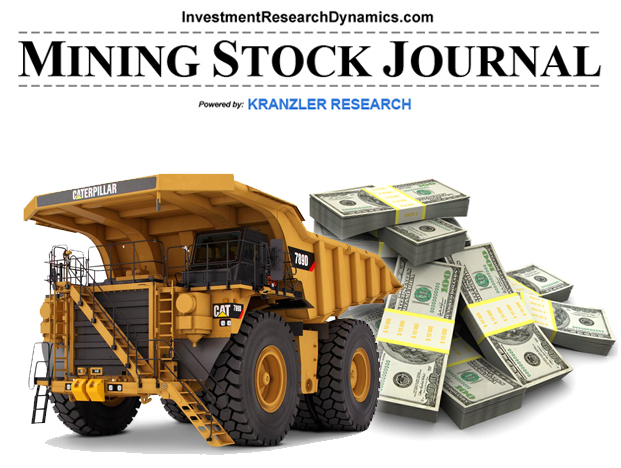 While the homebuilders are are squeezing higher, I presented two “derivative” ideas in recent issues of the Short Seller’s Journal: Zillow Group (ZG) at $50 in late June and Redfin (RDFN) at $28 in late September. ZG just lost $40 today and RDFN is down to $21 (25% gain in 6 weeks). Both ZG and RDFN are “derivatives” to homebuilders because they derive most of their revenues from housing market-related ads, primarily real estate listings. Their revenues as such are “derived” from housing market sales activity. These stocks are overvalued outright. But as home sales volume declines, the revenue/income generating capability of the ZG/RDFN business model will evaporate quickly. With home sales volume rolling over, the decline in the stock prices of ZG and RDFN relative to the “bubble squeeze” in homebuilder stocks validates my thesis. 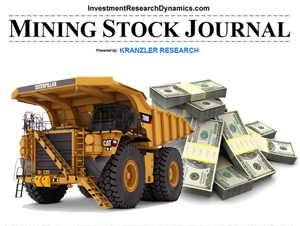 If you want to learn more about opportunities to exploit this historically overvalued stock market and access fact-based market analysis, click here: Short Seller’s Journal info. In my opinion, the ride down will be worth the pain and blood-loss of sticking with a short bet on TSLA, which is why I continue to buy small quantities of put options that have been expiring worthless. I know at some point I’m going to catch a $100+ reversal in TSLA stock which will more than make-up for the small losses I’m enduring in the puts while I wait for that occurrence. Using puts protects me from the unknown magnitude of upside risk from shorting the stock. Plus, I don’t have make a “stop-loss” decision because I don’t have the theoretic “infinite upside” loss potential that I would face shorting the stock. With my loss capped, I can hang on to the puts through expiration. With a stock like TSLA, often a stop-loss exit is followed up by reversal to the downside, leaving the short-seller without a short position. As we saw on Friday, TSLA stock can reverse to the downside quite abruptly and sharply. I can guarantee that some number of shorts covered as TSLA was soaring over $370, leaving them with no position when the stock reversed, closing at $357. I don’t want to recommend specific puts to use but I can recommend giving yourself at least four weeks of time. If I were putting on a new put position today, I would probably buy a very small quantity of the July 7th $340-strikes. If TSLA sells back to the $310 area before expiry, which could easily happen as $310 is where the last 2-week push up in price began, the puts would have an intrinsic value of $30. The current cost is about $10. TSLA reminds me of Commerce One (CMRC), a B2B internet company that went from $10 to $600 in a very short period of time in late 1999 – 2000. It eventually went to $0. I shorted and covered small quantities of stock starting around $450. I was fortunate to have been short from the high $500’s when it finally topped out a $600. The volatility of this stock was extraordinary but persistence and “thick skin” paid off. Driving by the west-side border of downtown Denver (on I-25), I can count 9 cranes in air plus one semi-finished high-rise building. What’s amusing about this is that there’s already an oversupply of rental apartments and condos as the 1-2 month free + free parking incentives reflect. What will happen when all these new projects hit the market? Miami was the leading indicator of the demise of the mid-2000’s housing bubble. An apartment glut quickly appeared as speculators took almost free money and put deposits on apartments being built by reckless builders. Builders always get reckless when other people’s money is cheap. Greenspan and Bernanke made sure there was plenty of cheap capital for developers. Wolf Richter details the current apartment market implosion occurring in Miami – LINK – and coming to city near you soon. Ditto for San Francisco/Bay Area, which was right behind Miami during the big housing bubble and is concomitantly blowing up with Miami. The SF/Bay Area market was driven by big foreign money laundering and a massive private equity tech bubble in Palo Alto. The foreign money has dried up and the PE tech bubble is fading quickly. It’s like the cheap money rug has been pulled out from under reckless speculators and developers. Mark Hanson describes the situation here: Adios SF Housing Market. Even some of the industry associations are starting to report the truth -something we’ll NEVER get from the National Association of Realtors, as the National Multifamily Housing Council reported a week ago that, “weaker conditions are evident across all sectors of the apartment industry.” Its sales volume index dropped for the second quarter in a row. 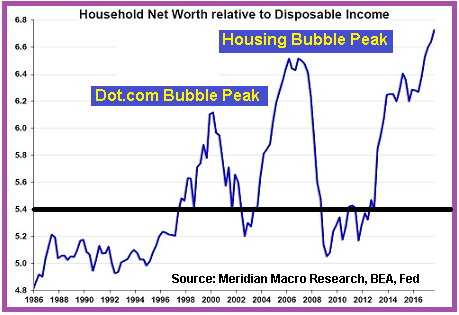 At the same time that a glut in apartment/condo buildings is appearing everywhere, the luxury high-end market is falling apart as well, the latter of which was also a leading feature of the demise of the big housing bubble. Douglas Elliman reported recently, “that prices in the Hamptons real estate market dropped nearly 30% in Q4, with sales volume down 14.5% But in the luxury end of the market – homes with an average price of $7 million – prices were down 42.6% in Q4. This is an all-out crash in housing in one of the most high-end areas of the country. This is exactly what began occurring in 2006/2007 in the Hamptons. was starting to go into a price freefall. Prices and volume started collapsing in the summer. Apparently in Q4 sales volume fell another 25% and prices were down another 11%. Beverly Hills sales volume plummeted 33%, though prices were flat. Again, the affects of the bursting big mid-2000’s real estate bubble was first felt in these same markets. Record low mortgage rates combined with the U.S. Government’s providing the easiest, most accessible borrowing terms and credit standards in the GSE program history has enabled the greatest misallocation of financial resources in history. It’s been manifest in every asset class but is particularly prevalent in stocks and the housing market. While it may be somewhat easy to unload stocks when they are dropping out of the sky, housing is a different matter. It’s easy to sell a home when the buying frenzy is rampant. But as the market begins to head south, the entire real estate becomes “offered with no bid,” meaning that everyone stuck with an “investment” is looking to dump and buyers scatter like cockroaches when the kitchen light is switched on. The home construction market is over-ripe with short opportunities. I have been focusing on the sector (plus retail and autos) in the Short Seller’s Journal. Since August, shorting the retailers has been a lay-up. In the SSJ, I present in detail the ways in which the industry associations, Wall Street – with the help of mainstream media cheerleading – distort the facts about the housing and auto markets. As the reality of what I described above sinks in to the market, the price path of least resistance for home builders, home construction suppliers and auto-related equities will be down. The same is true for the companies that provide financing to these industries.